The LCBO is currently doing a French wine education theme that I highly recommend for novice drinkers. Some of the wine picks (paid promotion) are not the best, but what’s important is your opportunity to understand the origin of the major grape varieties. Australia did not invent Chardonnay or Shiraz! If you’re interested, I’d like to offer a few of my French wine learning tips. 1. Memorize the following wine region name, Cotes-du-Rhone. It’s the Mecca of red wine. A place where grapes, soil, sun and man have combined to deliver a perfect product at an everyday price. Check out the two Louis Bernard wines. 2. 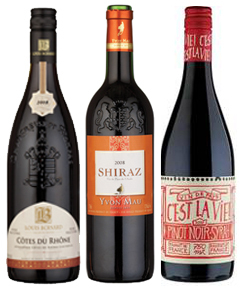 A light French red to explore for summer patio/picnic drinking is the bright, cheerful Yvon Mau Shiraz. Shades of a rustic Beaujolais. Refreshing and very gulpable. Lightly chill. 3. Something new in French wine packaging is the fun, Cest la Vie label. The wine is light, rustic and simple but I like it. Because it offers a traditional French café wine experience. No pretence. It has a little of the liveliness of a pinot and the mouth-filling smoothness of some shiraz. Felt odd – like flannel sheets on a summer night. Not sure I get it. I’ll try the bottom half of the bottle out of the fridge tonight to see if the chill brings out the brightness. I tried the C’est la Vie, partly because of the name, but also because it was the first bottle of the three that I found. I really liked this wine. The blend is interesting. I don’t know if it is my fondness for reds or, perhaps without knowing it, I have an affinity for cafe reds. If that be the case, bring ’em on … or bring on case.